Click to EnlargeBroccoli sprouts have been consumed for some time but more recent research has identified exciting new potential health benefits from their consumption. These health benefits are believed to be due to a group of molecules called glucosinolates and their derivatives, the isothiocyanates. The conversion is mediated by an enzyme called myrosinase, which is destroyed in most commercially available sprout powders. Some of the health benefits attributed to this family of molecules include: acitivity against a range of cancers; cholesterol assisting properties; some preventative activity for macular degeneration; and assistance with managing diabetes. It also appears to exhibit anti-oxidant activity and reduce oxidative stress and inflammation. 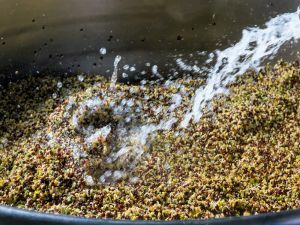 Dried Broccoli Sprouts are a concentrated source of glucosinolates and Canterbury Dried Food’s drying process is carefully controlled to ensure glucosinolates levels are maintained and the powder contains active myrosinase to ensure maximum conversion to beneficial isothiocyanates. What this means is that our Broccoli Sprout Powder is the real deal!